Buscar Kills 30 people at Kambu, Kibwezi in a fatal accident. - Bana Kenya News, Real African Network Tubanane. Home featured Mombasa Buscar Kills 30 people at Kambu, Kibwezi in a fatal accident. Buscar Kills 30 people at Kambu, Kibwezi in a fatal accident. A Buscar coach crashed at Kambu in Kibwezi. The bus was heading to Malindi. 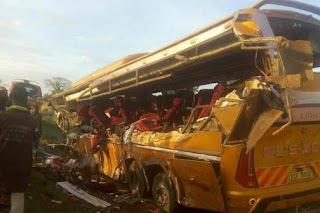 The bus killed 27 people and more ten people were seriously injured and taken to the nearby hospital at Kibwezi and the dead taken to Makindu hospital mortuary. It is speculated that the bus was over-ridden by a trailer and later crashed with a tanker. The bus which was at a high speed killed all the people who were in the front seat including the driver. Kibwezi OCPD Leonard Kimaiyo said that the Tanker and the remnants of the bus were taken to the Kibwezi police station. The OCPD urged people to go to the Kibwezi hospital to identify the bodies of their colleagues. The bus which carried almost 50 people, The accident happened in the early morning hours around 2 a.m at Kambu along Mombasa-Nairobi Highway. The bus company which had several accidents years back changed their names several times in order to evade the risk of closure. The company started with bus car label, Starways, Bus star, Busways and later last year they went back to the original name Buscar.